A pleasant Chianti imported from the Tuscany region of Italy. Made with a blend of Sangiovese grapes, this red wine offers up floral and red berry aromas along with a well-balanced structure. It is on the dry side, although with a slightly fruity tang, has a nice minerality and flavors of cherry and oak. Decant prior to serving to open up the aromas and tone down the acidity. A great Chianti for the price and one I will stock up on while still available. Food Pairing: This spicy, fruity wine compliments most foods and pairs best with tomato-based foods such as lasagna, pizza, bruschetta and Veal Parmesan, light meats, Italian cheeses and the more pungent vegetables such as zucchini, asparagus and roasted garlic. Yes, you can put wine in gravy and it tastes delicious! 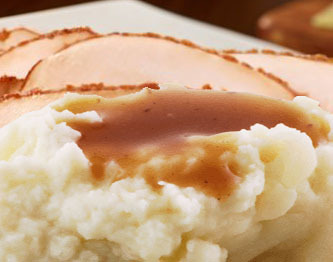 Try this recipe out next time you have mashed potatoes with poultry for dinner. It really seems to add a more gourmet dimension to your typical chicken gravy. In a medium skillet, melt butter. Add mushrooms and cook 3-4 minutes or until softened, stirring often. Mix in cornstarch, stirring continuously until incorporated. Add in chicken broth, wine, green onions, salt and pepper. Cook, continuing to stir, until thickened, about 3-4 more minutes. Serve hot with mashed potatoes. Once in a while my husband and I like to have a meatless meal just for a nice change-up. Black beans are such a good source of protein, 1 cup offers about 30% of your daily protein requirement, as well as providing high percentages of iron, folate and fiber, that they are always one of our top choices for just such a meal. 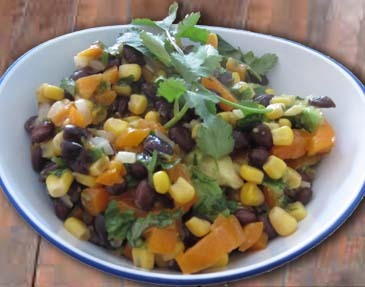 Black beans have also been recognized as providing health benefits for the digestive tract and the colon. Research has found that eating 3 cups of legumes a week will provide optimal health benefits. I adapted this recipe from one I found on Once Upon A Chef and it proved to be absolutely over-the-top delicious! Hope you enjoy it as much as we did. By the way, this also makes an excellent side dish for fish or chicken dinners. Mix all of the above ingredients together, except avocado, and place in refrigerator for flavors to mix for about 6 hours. To serve: Prepare avocado and gently mix into salad. Let sit for an hour at room temperature, garnish with additional cilantro, and serve. Note: By rinsing or soaking the beans you can reduce the flatulence-related substances by as much as 33%. Friday is finally here! The long weekend is behind me and my birthday weekend can now begin! 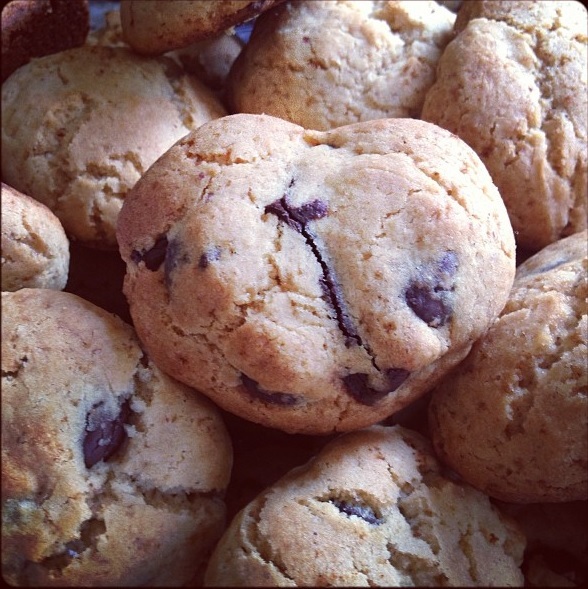 To start things off right, I’ve made my first batch of gluten-free chocolate chip cookies. Just what the birthday girl ordered! 😉 Enjoy! Preheat oven to 350°F. Cream butter, swerve, agave, egg, vanilla, and stevia in mixing bowl. Mix in coconut until just combined. Add next 3 ingredients to wet batter and blend well. Hand stir in chocolate chips. Place 2 inch scoops on lightly greased cookie sheets and bake for 11-13 minutes or until edges start to brown. Let cookies cool slightly and use a spatula to remove from cookie sheet and place on wire rack. After my wine tasting in Chicago, I had to search out and find a Chilean wine that stood as a good example of the delicious wines that can be found in that region. 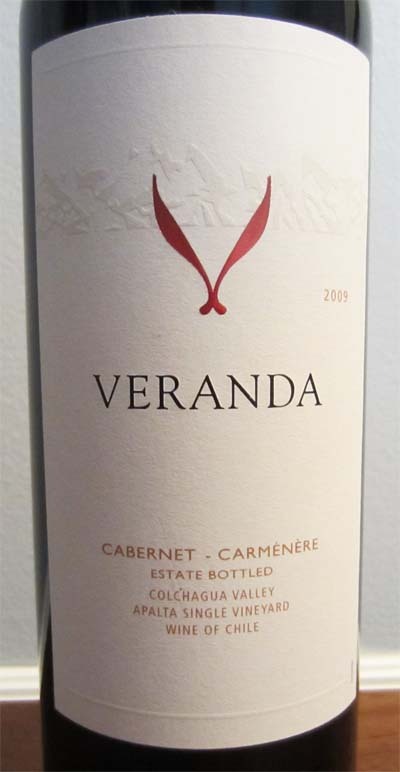 The 2009 Veranda Cabernet-Carménère is an excellent example of just such a wine. The Veranda Cabernet is an estate bottled wine from the Colchagua Valley of Chile where Cabernet Sauvignon, Carmenere and Syrah wines are predominant. It is a medium-bodied red wine blend with dark fruit and earthy aromas and just the right hint of smoky notes. Its flavors are well structured and primarily of blackberry and plum, courtesy of the Carmenere grapes, but the finish is all Cabernet, with the taste of black cherry coming to the forefront. A wonderfully rich wine that will pair well with heavier meals. I recommend everyone stock up on this one while it is still available. Food Pairing: As with the fuller Cabernet Sauvignons, this blend of Cabernet and Carmenere, pairs best with the rich and powerful flavors of grilled meats as the dark fruit and spiciness compliments the smoky taste of the grill. Last week I took a trip up to Chicago to visit my sister and we wined and dined ourselves at some interesting and tasty restaurants. 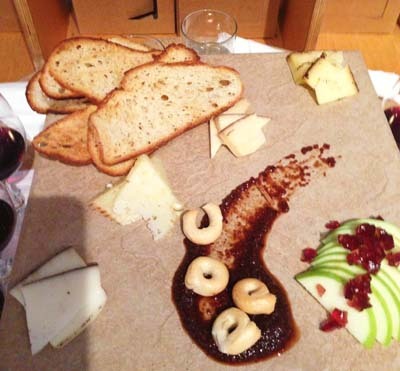 And one of the most fun adventures was our wine and cheese tasting at Bin 36. Bin 36 is just a little off Michigan Avenue and is a popular place for early evening get-togethers. The restaurant is very spacious with tables for dining, at least 2 bars and a private party area upstairs. They have a menu which groups both cheeses and wines into regions where you can pair the wines with similar area cheeses or just order individually. We decided on a flight of wines, each to our particular tastes, and shared a cheese flight as well. Our cheese flight, better known as Positive Algebra, consisted of 4 cheeses, Cocoa Cardona from Wisconsin, a creamy, mild goat cheese dusted with cocoa powder (excellent), Bella Vitano, also from Wisconsin, with a nutty flavor and bathed in balsamic vinegar (oh so excellent), a Spanish manchego marinated in olive oil and rosemary (again an excellent choice) and lastly Barely Buzzed from Utah, a heartier cheese with an expresso crust. All this is served with green apple slices and wonderfully crisp crostini. 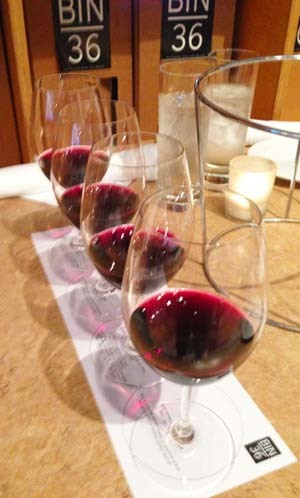 My wine flight consisted of 4 red wines from Argentina & Chile. I have to say that the first wine was really the best of the four. The first was a 2011 Malbec from Hacienda Los Haroldos. The bouquet was not as evident as I would like but the fruit forward taste was definitely enjoyable. Flavors of dark cherry and plum were most prominent with balanced tannins and notes of vanilla, chocolate and toasty oak. I would rate this a 3.5/5 and would order again. Purchase at the store for around $9 a bottle. 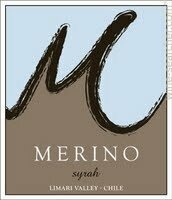 My second wine was a 2012 Merino Syrah, a medium weight red wine from Chile. This was another fruit forward wine with a nice balance and some acidity. Not as rich in flavor as I would have liked following the Malbec but I could detect tastes of blackberries and raspberries with a long minerality and spiciness at the finish. Rating of 3/5. Purchase for around $17 a bottle. Third was the 2012 Crios Red Blend from Argentina. A long name for this varietal that encompasses the Malbec plum flavors (40%) with the cherries and raspberries from the Bonarda (40%), the blackberries and blueberries from the Tannat (15%) and spicy black pepper and cloves from the syrah (5%). As you can see it is a veritable fruit cocktail and is slightly different than your average blend, however it does hold its own and the finish is enjoyable. Rated 3/5 or maybe 3.5/5 and averaging about $12 per bottle. Lastly was a 2010 Morande Carmenere from Chile. This red was the most complex of the four with flavors of ripe blackberries and hazelnuts and an earthy texture with hints of green peppers and smoke. It had a rounded mouth feel with soft tannins and a somewhat long finish but didn’t sit well on my palate. It also seemed out of order with the flight choices. Rated 2.5/5 and runs about $12 per bottle. 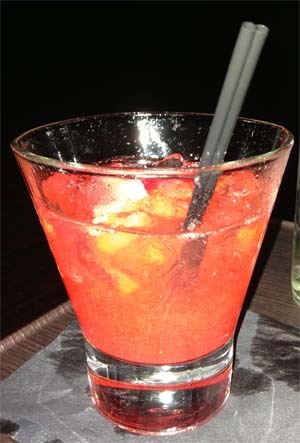 Recently my husband and I went to a cool sushi bar called Buddha Sky Bar in downtown Delray Beach, Florida. If you are ever in the South Florida area this is definitely a restaurant you should make an effort to visit. It is small and decorated very nicely, with superb food and service as well as a nice view over Atlantic Avenue, the main attraction. During our visit we had the most delicious Pineapple Fried Rice that i just had to try and duplicate it. And I have to say, it came out pretty well. If you get all the ingredients cut up and separated ahead of time it is really quick and easy to make. Hint: Make the rice the day before and put it in your refrigerator overnight. Cook rice according to directions. 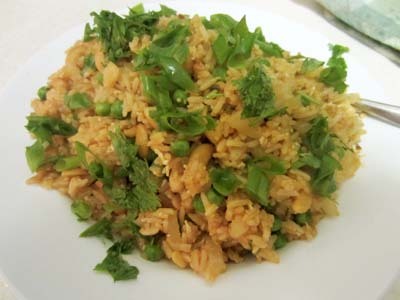 This recipe works best if the rice is cooked the day before so it dries out slightly. If cooking the same day, cook earlier in the day and place in refrigerator without a lid so it dries more quickly. Place onion, garlic and red pepper flakes together in bowl. Place carrots & peas in a second bowl. Place rice mixed with 1 Tablespoon of vegetable oil, pineapple chunks and cashews in another bowl. Mix soy sauce and Thai curry paste together and set aside. To cook: Heat 2 Tablespoons of oil in large skillet over medium-high heat. Add the onion mixture from the first bowl and stir-fry for about 1 minutes. If pan becomes a little dry add a little chicken stock or white wine. Add the 2 eggs and scramble quickly mixing in with onion mixture. Add the carrots and peas from second bowl and stir-fry another minute or two. Now add the rice mixture to the pan along with the soy sauce/curry paste and stir-fry about 5-8 minutes. They usually say to cook until you hear the rice making popping sounds. Place into serving bowl and garnish with green onion and cilantro. Note: This recipe is gluten-free if you use both gluten free soy sauce and brown rice or a jasmine rice that has not been over processed. For a meatier option, add shrimp or chicken . Wine Pairing: A white wine with a little citrus flavor blends well with the pineapple in this dish. 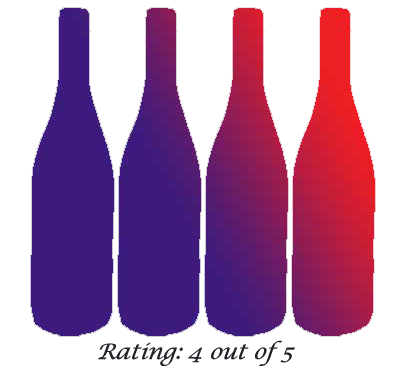 Try a Pouilly-Fuisse, Pinot Gris or Sauvignon Blanc although some Chardonnays will work here as well. Saturday mornings are my favorite! Sleeping in (well as much as you can with a toddler), staying in your pj’s, and serving up a creative & fun breakfast for the entire family. 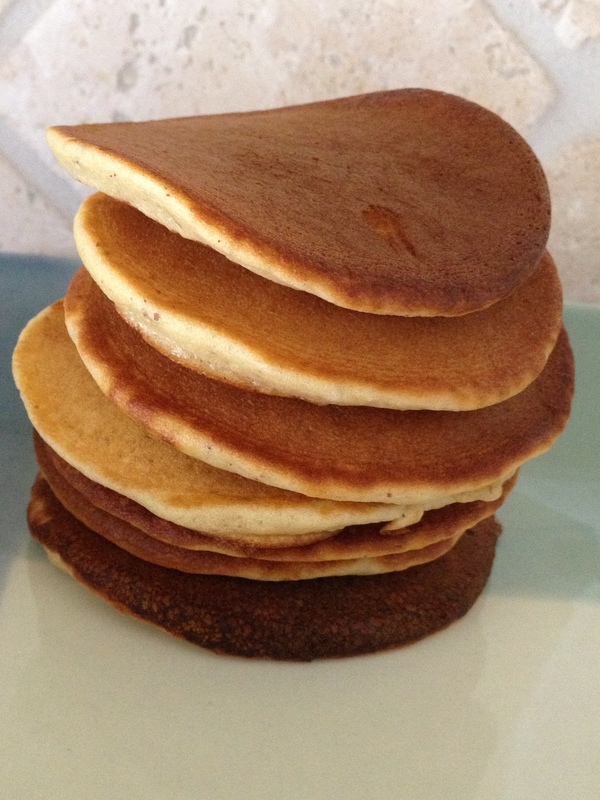 This past weekend, my husband took the reigns and made us our first batch of gluten-free pancakes. What a treat! Serve these with your favorite fruit or sweeten them up for special occasions with chocolate chips & whipped cream. If you extra pancakes left over let them cool, wrap them in plastic, and freeze. To reheat just pop in the toaster or microwave for 30-60 seconds! Combine all ingredients together and mix until smooth. Preheat pan over medium-low heat. 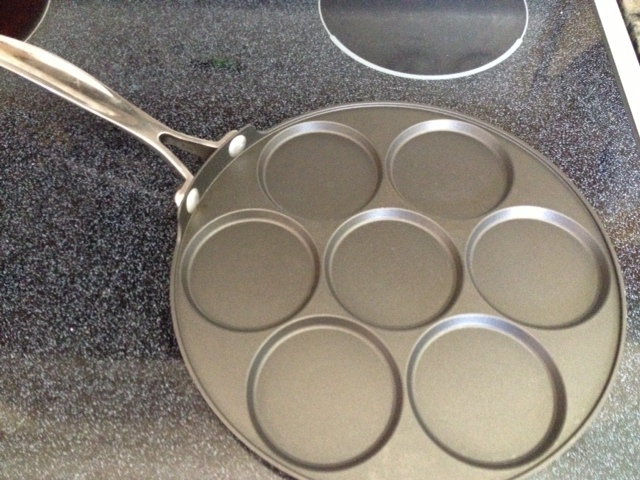 We used the silver dollar pan by Bobby Flay, but any pan will do. Lightly spray non-stick cooking spray on pan and pour in batter. Cook on one side until you see small bubbles forming on the edges. Flip once and continue cooking until golden brown. We were having guests over for dinner last night and I was serving some delicious looking steaks with zucchini and prosciutto skewers and wanted a full-bodied wine that would compliment the meal such as a Cabernet Sauvignon or a rich Zinfandel. After perusing the wine store aisles I found this California Zin that had a high rating of 92 and also a recommendation from the wine buyer. What more could I ask for? And they were right on the money – a super fantastic wine for under $20 that tasted more like a $60 bottle. Macchia winery, located in Acampo California, gives their Zins very interesting names such as Outrageous, Adventurous and Oblivious and I am sure each one lives up to its namesake and this 2011 Zinfandel is no exception. Blended from 5 different vineyards, using the grapes from the stronger older vines, Macchia has produced a classic fruit-forward wine with rich berry flavors, just the right amount of oak, some earthiness and a subtle hint of vanilla. It has a wonderfully smooth finish and is the perfect accompaniment to steaks, grilled dishes as well as rich pastas. Note: This wine has a higher alcohol content than most wines coming in at 16%. My daughter and her husband recently went to the theater with my husband and I and they served us one of the most delicious and fresh tasting drinks I have had in a long time. I just had to try and make a similar version at home. Here was my take on a Strawberry Lemonade. Use only organic strawberries as vodka acts as a solvent and you want to extract only the juice of the berries not additional pesticides or chemicals. Rinse strawberries. Remove stem and cut into quarters. Place cut-up strawberries in a large glass jar that comes with a lid. Pour in the vodka and secure lid. Shake well. Store in a cool dark place for approximately 3-7 days, shaking jar once a day. You can check to see if the flavor has been absorbed on day 3. If the strawberries are white and the vodka pink, extraction is complete. When ready, strain with cheese cloth and discard strawberries (they should not have any flavor left). Store in refrigerator for up to 2 weeks or keep in freezer for longer. In a cocktail glass, add strawberry vodka and lemonade, a couple tablespoons of crushed strawberries and 1-2 lemon slices. Serve over ice with straw and enjoy! Never Look Back. Pay It Forward. Losing the Weight. Gaining Perspective. Busy Vegan Girl. Big Belly Appetite.